Marinas.com has notified the City of Paducah that Paducah’s Transient Boat Dock is a recipient of the 2018 Boaters’ Choice Award. This is the second consecutive year for Paducah to receive the award which honors marinas and docks that consistently provide an excellent home for the boating community. According to Marinas.com, 217 marinas/docking facilities are being honored for going the extra mile in 2018 for boaters. The Boaters’ Choice Award is based on reviews by boaters. To be recognized, each facility had to receive at least three reviews averaging a rating of four or more stars out of five stars. Below are a couple of the reviews posted by boaters who enjoyed Paducah’s amenities in 2018. Coming through in 2015, I couldn't understand why Paducah had no facilities for cruisers. This has now been wonderfully resolved with the new docks. I hope the town reaps the benefits from all the cruisers that stop by. I grocery shopped and had dinner in town so hope I helped the economy in some small way. The docks are a superb piece of engineering and built at considerable cost. We appreciate the town's foresight. Fantastic Dock that we will visit again and again. Within walking distance of the downtown with plenty to see and do! Restaurants and downtown merchants are many and the River Wall art and The Quilt Museum with the Ohio River are fun things to see. Thanks Paducah!! In 2018, 360 boats docked at Paducah’s Transient Boat Dock spending a total of 522 nights. For the 27th consecutive year, the Government Finance Officers Association of the United States and Canada (GFOA) has awarded the City of Paducah the Certificate of Achievement for Excellence in Financial Reporting for its Comprehensive Annual Financial Report (CAFR). The CAFR is a voluntary document compiled by the City for review and grading that includes the city’s audit and various financial and statistical reports. 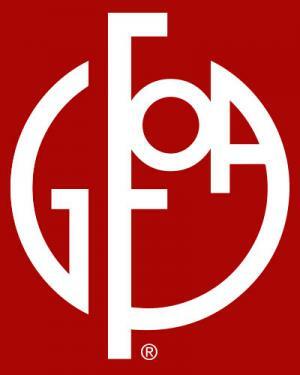 According to the GFOA, the Certificate of Achievement represents a significant accomplishment by a government and its management and is the highest form of recognition in the area of governmental accounting and financial reporting. Paducah’s award is for the fiscal year that ended June 30, 2017. This internationally recognized award is one element necessary for the City to maintain a strong S & P bond rating of AA-. The Arbor Day Foundation in partnership with the U.S. Forest Service and the National Association of State Foresters has named Paducah a 2017 Tree City USA. This is the 26th consecutive year Paducah has achieved this honor recognizing the efforts by the community to make the planting and care of trees a priority. Paducah achieved Tree City USA recognition by meeting the program’s four requirements: a tree board or department, a tree care ordinance, an annual community forestry budget of at least $2 per capita, and an Arbor Day observance and proclamation. Paducah is one of more than 3,400 Tree City USAs. Trees provide multiple benefits to a community when properly planted and maintained. Some of the benefits include improving the visual appeal of a neighborhood, increasing property values, reducing home cooling costs, removing air pollutants, and providing wildlife habitat. In December 2017, Marinas.com notified the City of Paducah that Paducah’s Transient Boat Dock is a recipient of the 2017 Boaters’ Choice Award. Paducah and Green Turtle Bay Resort in Grand Rivers, Kentucky received the honor in the Inland category. The annual Boaters’ Choice awards, organized by Marinas.com, is a long-standing tradition within the boating community. According to Marinas.com, 152 marinas/docking facilities are being honored this year for going the extra mile to make boaters feel at home. 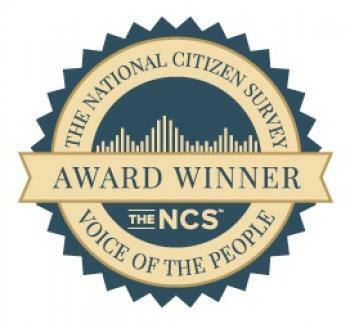 The Boaters’ Choice Award is based on reviews by boaters. Each facility had to receive at least three reviews averaging a rating of four or more stars out of five stars to receive the honor. Following is one of the reviews posted by a boater who enjoyed Paducah’s amenities. Great facility in which we could tie up to either side of the dock. Beautiful downtown area within a couple of blocks from the dock with many great restaurants (some with live music), and cute shops. The town has cab and Lift services to stock up supplies from Wal-Mart or a local grocery store. We also enjoyed the 4 mile bike path just a couple blocks from the city dock. Could have stayed another day to take in the many museums. What a GREAT stop!!! Kentucky League of Cities (KLC) Community Development Advisor Bobbie Bryant presented the City of Paducah with an Enterprise Cities Award for the Pat & Jim Brockenborough Rotary Health Park at the November 14, 2017, City Commission Meeting. This award recognizes city projects or programs making a true impact in their communities. This is the second year in a row that Paducah has won for a project in the historic Fountain Avenue Neighborhood. This year’s award recognizes the work by the City of Paducah, various partner agencies, and volunteers in creating the Health Park located at 421 North 13th Street. In 2016, the Rotary Club of Paducah in addition to hundreds of volunteers constructed the Paducah Rotary Playground. In November 2016, the City contracted to construct Phase I which includes a 1/3 mile walking trail, the playground’s safety surface, a fitness area, the grading and resurfacing of the grassy lawn, lighting, landscaping, water fountains, and an expansion of the Community Garden. A ribbon cutting was held in August 2017. At the ribbon cutting celebration, it was announced that Mrs. Pat Brockenborough is donating $500,000 toward the construction of a restroom facility and splash pad for Phase II. The Enterprise Cities Award program is sponsored by Collins & Company, Inc. The sponsor is providing $1000 for each winning program to help continue its success. Paducah received the award in addition to Bowling Green and Morgantown. For the 26th consecutive year, the Government Finance Officers Association of the United States and Canada (GFOA) has awarded the City of Paducah the Certificate of Achievement for Excellence in Financial Reporting for its Comprehensive Annual Financial Report (CAFR). This award is for the fiscal year that ended June 30, 2016. The CAFR is a voluntary document compiled by the City for review and grading that includes the city’s audit and various financial and statistical reports. Paducah police Officer A.J. Parrish was honored December 13, 2016, at the Governor’s Impaired Driving Enforcement Awards ceremony in Lexington. Parrish was among law enforcement officers from throughout the state who were recognized for their efforts to keep impaired drivers off of Kentucky’s roadways. Parrish arrested 45 people on charges of driving under the influence during the program’s counting period – Oct. 1, 2015, through Sept. 30, 2016. 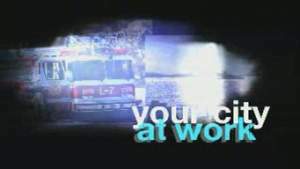 The Paducah Police Department’s total number of DUI arrests during the counting period was 215. Parrish, 24, has been with the department since May 2014. Paducah has been selected as a top retirement destination by Where to Retire, the only magazine in America geared toward helping people with retirement relocation decisions. The city is profiled in a feature titled “8 Rejuvenating River Cities” in the July/August 2016 issue, available nationwide on June 14. Where to Retire Editor Annette Fuller said many retirees migrate to water, and these eight cities, with stunning rivers close by, are good ones to consider. “River cities, including Paducah, situated near the Ohio, Cumberland, Mississippi and Tennessee rivers, appeal to retirees who seek the outdoors. Bird watching or fishing along the banks, hiking nearby trails, boating and camping are just a few of the available activities. Not everything revolves around water though; quaint downtowns, continuing education opportunities and a variety of shopping and dining options contribute to a well-rounded retirement,” Fuller said. 8 Rejuvenating River Cities: Asheville, NC (French Broad River); Augusta, GA/Aiken, SC (Savannah River); Bend, OR (Deschutes River); Covington, LA (Abita River); Grand Junction, CO (Gunnison and Colorado Rivers); Paducah, KY (Ohio, Tennessee, Cumberland and Mississippi Rivers); Victoria, TX (Guadalupe River); Wenatchee, WA (Columbia River). The Government Finance Officers Association of the United States and Canada (GFOA) has awarded the City of Paducah the Certificate of Achievement for Excellence in Financial Reporting for its Comprehensive Annual Financial Report (CAFR) for the fiscal year that ended June 30, 2015. This is the 25th consecutive year Paducah has received the award. The CAFR is a voluntary document compiled by the City for review and grading. This internationally recognized award is one element necessary for the City to maintain a strong S & P bond rating of AA-. The CAFR is divided into several sections: Introductory, Financial, Statistical, and Single Audit. When I was asked by the NEA Chairman’s office if I would consider traveling to Paducah to give a grants workshop, I jumped at the opportunity for several reasons. First, because of my grants portfolio, I’m acutely aware that we’re not seeing many grant applications from the area. But what really got me excited me was the prospect of experiencing first-hand what Paducah has to offer. In my world, the Artist Relocation Program and the UNESCO Creative Cities designation are outstanding exemplars of a community that is embracing artists and culture to define itself, and put the city on the map. What I found far exceeded my expectations. Jane Jacobs famously said that new ideas must use old buildings. I saw ample evidence of that throughout my brief, yet intense tour of this architecturally rich city. I had a chance to tour the Paducah School of Art & Design, which has to be one of the most inspiring state-of-the art facilities for artists and art students to be found anywhere. It’s a beautiful and thoughtfully re-purposed light-filled crown jewel that will surely be a beacon for creative visual artists in all disciplines. And I can’t help but imagine what kind of wonderful and powerful impact that creative engine is going to have on the community! Although I was only in Paducah for a short visit, I was impressed by the people I met. Nearly 50 people from all walks of life in surrounding counties gave me a warm welcome and generously offered insight into what I think must be the “secret sauce” of the cultural community: collaboration - coupled with a deep and abiding respect for the sense of place that makes Paducah unique. Instead of six degrees of separation, I jokingly suggested that there are really only two degrees in this tight-knit and civic minded community. But as an outsider, I felt welcomed. Clearly, this community is doing a lot of things right, and is willing to be open to new people and new ideas, and to share that secret sauce. In response to the testimonial from Michael Killoren, Paducah Mayor Gayle Kaler said, "The community will continue to grow our arts IQ because the Genie has been released from the bottle. There is no stopping the growth of Paducah's Creative Culture." Paducah received 8 points with the following information posted on the website. In 2000, Paducah, Kentucky made the risky move of offering incentives to artists willing to relocate to downtown Paducah. Today, the small Kentucky town is a thriving community built around the arts. Besides the many Victorian houses and art galleries lining the town’s main street, art-loving wanderers will find the series of Floodwall Murals depicting events in local history and the rotating exhibits of the National Quilt Museum. Thanks to Paducah’s Arts a la Carte program, many artists set up workstations directly on the sidewalk for the enjoyment of passersby. A number of festivals — both art themed and otherwise — also occur in Paducah throughout the year. Paducah has been awarded the 24th consecutive Certificate of Achievement for Excellence in Financial Reporting by the Government Finance Officers Association of the United States and Canada (GFOA). The Certificate of Achievement is the highest form of recognition in the area of governmental accounting and financial reporting. This 24th award recognizes the CAFR for the fiscal year that ended June 30, 2014. In March 2015, Dating Advice named Paducah #13 in the "20 Best Cities for an Inexpensive Date." The Dating Advice Article reads, "Nestled in the far left corner of Kentucky lies Paducah, an adorable town filled with just as many adorable date ideas for couples of any age, particularly the artsy types." The cost of living is low in Paducah, and we have great restaurants, shops, and cultural venues!! The financial technology company, Smart Asset, listed Paducah as the sixth best place to retire in Kentucky. Paducah ranked number 707 of more than 4000 cities it evaluated nationally. The study ranked cities based on factors such as income and sales tax rates, number of seniors in the community, the number of doctors' offices, and the number of recreation centers. Using data from the Council for Community and Economic Research’s 2013 Annual Report, NerdWallet ranked the most affordable cities in America. The index scores can be compared to the national average of 100. A lower cost of living index signifies greater affordability relative to the average city. States from central and southern U.S. dominate the list. Paducah ranks #61 with a cost of living index of 90.2. 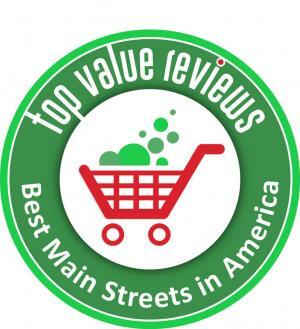 On January 11, 2014, the Huffington Post posted an article from Fodor's Travel about America's Best Main Streets. Paducah is listed as one of the 15 best main streets due to its rich history and variety of cultural attractions. The City of Paducah was honored December 11, 2013 for winning the NeighborWorks' Innovative Ideas Video Contest through NeighborWorks America. This video featuring the City of Paducah's Fountain Avenue Neighborhood Program was recognized at the NeighborWorks conference in Kansas City for being a great example of neighborhood collaboration. For more information about the Fountain Avenue Neighborhood, visit Fountain Avenue Website. Paducah Police Officer Ryan Burrow was among those honored December 3, 2013 at the annual Governor’s Impaired Driving Enforcement Awards ceremony in Louisville at the Marriott Louisville East. Burrow was the PPD’s top officer in arrests for driving under the influence offenses between Oct. 1, 2012, and Sept. 30, 2013. Of the department’s total 342 DUI arrests, 44 were Burrow’s.The Paducah Police Department is a part of Division 4, which is for agencies with 51-150 officers. The Paducah Police Department was honored October 18, 2013 with a "Heart of Collaboration" award at the 5th annual Collaborative Women’s Conference held at Broadway United Methodist Church of Paducah. It is a fund-raiser for the United Way and a networking opportunity for women from throughout the area. In presenting the award to Police Chief Brandon Barnhill, Dr. Bernice Belt cited the department’s continuing accomplishments in community policing, youth programs and initiatives, non-profit partnership and in encouraging minorities and women to pursue careers in law enforcement. This has been done while the department continues to raise standards in community outreach, recruitment and training, both locally and beyond. Paducah has been awarded the 22nd consecutive Certificate of Achievement for Excellence in Financial Reporting by the Government Finance Officers Association of the United States and Canada (GFOA). The Certificate of Achievement is the highest form of recognition in the area of governmental accounting and financial reporting. This 22nd award recognizes the CAFR for the fiscal year that ended June 30, 2012. For more information about the award and about the Paducah Finance Department, watch this episode of Paducah View - Comprehensive Annual Financial Report featuring Finance Director Jonathan Perkins. For the second year in a row, the Paducah Sun asked readers to nominate people, places, etc. for specific categories. Paducah won two awards: Best Golf Course for Paxton Park and Best Playground Indoor-Outdoor for Noble Park. Noble Park was a finalist for Best Family Value and for Best Place to Hike. Downtown Paducah was a finalist for Best Family Attraction. Paducah Power System's Christmas in the Park at Noble Park was Best Local Holiday Tradition with the Christmas Parade coming in second place. The September/October 2012 issue of Where to Retire magazine profiles Paducah in its feature story, "15 Low-Cost Towns". 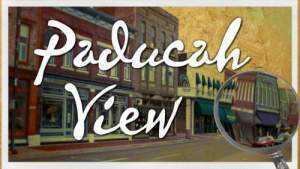 Where to Retire editor Mary Lu Abbott said Paducah possesses qualities important to today's retirees. "With below-average living costs, affordable homes, and low taxes, these 15 towns let your retirement dollars go further." Paducah is considered as a four-season locale that has rich history and plenty of outdoor opportunities. Paducah Police Officer Melissa Dillon was honored July 26, 2012 in Lexington, Kentucky during the annual Governor's Occupant Protection Enforcement Awards Ceremony. Dillon issued the second-highest number of seat belt violation citations in her division. Divisions are determined by department size. Dillon issued 858 seat belt/child restraint/booster seat citations during the counting period, June 16, 2011 – June 15, 2012. 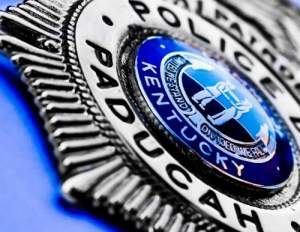 In all, Paducah Police Department officers issued 3,327 citations for those offenses during the counting period. In February 2012 the Paducah Sun newspaper asked people to nominate people, places, etc. for specific categories. Paducah won several awards including Best Bike Path for Noble Park (finalist was Greenway Trail); Best Place to Jog for Noble Park (runner-up was Greenway Trail with Downtown as finalist); Best Local Holiday Tradition for Lights in the Park at Noble Park (Christmas Parade was runner-up); Runner-up for Best Playground at Noble Park; Paxton Park runner-up for best golf course and finalist for best driving range; Stuart Nelson Park runner-up for Best Place to Hike with Noble Park as a finalist; Best Annual Festival for BBQ on the River (Dogwood Festival was a finalist); Best Entertainment Value for Noble Park; and of course, Paducah was the winner for Best Town to Live. To celebrate the numerous awards earned by the City, West Kentucky Community & Technical College, and the Paducah Area Chamber of Commerce, the City launched the Award Winning Paducah website and Celebrating Excellence Campaign. Paducah has been awarded the 20th consecutive Certificate of Achievement for Excellence in Financial Reporting by the Government Finance Officers Association of the United States and Canada (GFOA). The Certificate of Achievement is the highest form of recognition in the area of governmental accounting and financial reporting. The award recognizes the City's Comprehensive Annual Financial Report (CAFR). This 20th award recognizes the CAFR for the fiscal year that eneded June 30, 2010. 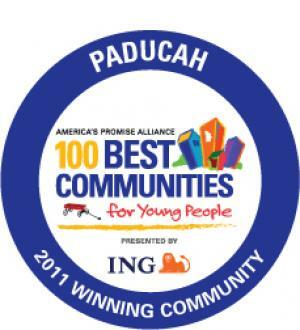 On October 12, 2011, Paducah officially achieved national recognition as one of America's Promise Alliance's 100 Best Communities for Young People presented by ING. The competition recognizes communities across the country that focus on reducing high school dropout rates and providing service and support to their youth. In August 2011 the National Quilt Museum of the United States received the Community Arts Award through the Kentucky Arts Council's Governor's Awards in the Arts. The award recognizes a Kentucky individual or organization that has made a positive impact on the community through the Arts. In August 2011, Paducah was selected by "Where to Retire" magazine as one of eight top retirement towns. The article "8 Enticing Money-Saver Towns" is in the September/October issue of the magazine. Pictured from left to right: KLC President Elaine Walker, Planner Ben Peterson, City Commissioner Gerald Watkins, Planning Director Steve Ervin, and KLC Acting Executive Director Neil Hackworth. Pictured from left to right: KLC Acting Executive Director Neil Hackworth, City Commissioner Gerald Watkins, KLC President Elaine Walker, Police Chief James Berry, Captain Brian Krueger, and KLC Law Enforcement Specialist Mark Filburn. Pictured from left to right: KLC Acting Executive Director Neil Hackworth, City Commissioner Gerald Watkins, and KLC President Elaine Walker. Photo is from Bikes on Broadway.